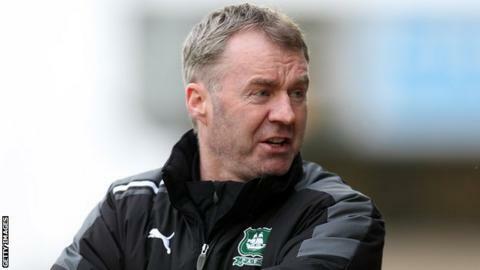 Plymouth Argyle boss John Sheridan believes his side can avoid relegation, despite being three points adrift at the bottom of League Two. A coupled with Barnet and Accrington winning, opened up a gap between Plymouth and the rest of the division. "I believe that we'll get out of the position and we won't be in the bottom two," Sheridan told BBC Radio Devon. "That's the most important thing at the end of the season." Sheridan says he is now focusing on Saturday's clash with fourth-from-bottom Barnet at Home Park as his side try and improve their record of one win from their past six games. "I can see the lads are working very hard," he said. "There's going to be lots of twists and turns and we've just got to stay in that pack. "Saturday's game is a massive game and we've got to try and win one or two games sooner rather than later." But Sheridan says he is pleased with the work-rate his side are putting in. "I thought it was a good battling performance, I thought we worked really hard and I can't fault their effort," he added. "If we were cute enough I think we had good opportunities to use the ball better in the opposition's half and if we would have done that we could have caused them problems. "But we're defending very well and working very hard to keep the ball out of the back of our net."